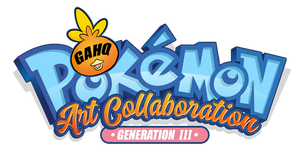 Almost 9 weeks and over 150 of the 270 possible slots are taken already with almost 140 Pokemon illustrations already drawn! Usually I expect the dragon types to get snapped up really quick based on typing alone, but by the time that I got the word go for a fifth contribution, Bagon was yet to have gotten an illustration for some reason. Yes, I know, its fully evolved form Salamence is a beast to use and had been made even better with its mega evolution for Omega Ruby and Alpha Sapphire, but no one should rule out Bagon - it's even a strong performing beast in Little Cup conditions thanks to its high attack stat, allowing it to benefit with Dragon Dance and a good selection of physical moves. Problem is, Dragon type moves were classified as Special in the original Game Boy Advance games, so it would've required some careful adaptation to its stats to even give it more of an edge in the competitive field. It's still a cute little fellow to draw, so I felt it would be cool to match it up with the first Gym Leader reward TM in the game - Rock Tomb, a rock-type move that does damage and also has a secondary effect of slowing down the target Pokémon. It's a very situational move, but Roxanne would want you to feel proud to use it especially in early-game, where instead of grinding like crazy to overcome your opponents, a strategic placement of one or two of these could help you overcome some fast and brutal creatures really quickly. Also, Bagon's main ability is Rock Head so it makes sense to align it with a similar sounding move! You can see the sketch version as yesterday's entry in my 365 sketch challenge for 2018, as always. Excellent work as usual from you, its looking great! Awesome, glad to see it got through x) I am still on standby in case you need more slots, but either way this tribute is turning out to be a load of fun! The Air Train for Haven City soon started to gradually head its way in a South East direction, hovering a thousand feet from the ground. Its shadow shows up like an ant upon the ground. Inside the train itself, most of the Krimzon Guard present were seen looking outside the windows, seeing the view below as the scenery changed from an industrial setting to a more wasteland-type scene. Near one of the windows, Erol looked towards Crista with a face starting to fill with fear. And with a light smile on her, she placed a hand around his shoulder, bringing his head close towards her chest. He looked up towards her cautious face, knowing that they could be filled with comfort for most of their journey. By then, his eyes returned to the window, seeing Haven City as nothing more than a metallic lump in the background. It had been 18 hours and 396 days, since Haven City faced a serious amount of damage. The walls of the East of the town were knocked down, and even now they were only partially repaired. Only a matter of time could be shown until the part of the city could surely crumble. One of the biggest aspects of damage inflicted upon the town came near the center, around the palace, where the previous King and Queen ruled over the city, and once made sure that the civilization was in perfect order. But everything suddenly had to come to a standstill. The creatures that were the Metal Heads stormed their way through the front door and managed to attack their way through towards the family, knowing that they could be pummeled down in an instant. And since that scenario, no one ever heard from the relations again, or what happened to their young heir to the throne. But as the civilians knew it, life had to move on and look onto a new era being brought upon the city.